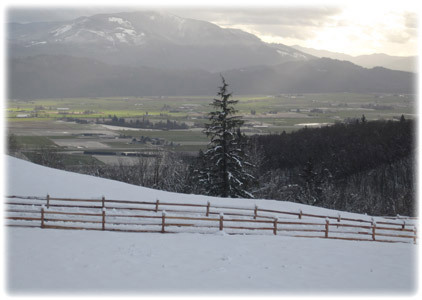 At this time of year (January) it's not uncommon to have snow on our farm, even when the rest of the lower mainland isn't getting any. Being on a mountain, we're a few degrees colder than the rest of Abbotsford --- and that means a slightly longer winter for us. Snow on our farm, but none down below. All the farm work still needs doing, even with the snow --- and sometimes that means getting innovative. If the weather gets cold enough, the water starts to freeze --- and that's when tank de-icers can come in handy (trough heaters). Thankfully, it doesn't usually get that cold, and the water lines keep flowing. 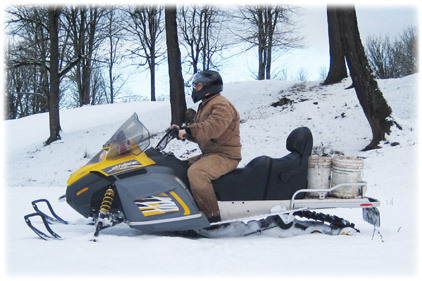 Feeding the pigs and the chickens can be a little more work --- sometimes the snow is too deep for the farm truck, and we use a skidoo instead. We've had winters where the snow has been close to waist deep. Sometimes the skidoo is almost essential. Feeding the livestock on the skidoo. Mostly the livestock don't mind cold weather or snow --- but they don't like harsh winds. 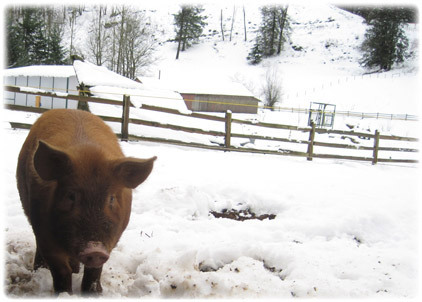 Although all the animals have shelter available if the want it, neither the pigs nor the cows seem to like cover --- they generally prefer being out in the open, even on snowy days like these. This little piggy is about 4 months old --- not quite ready for slaughter. 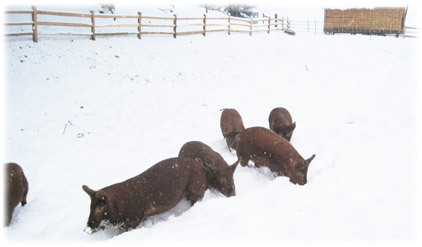 A few more of our pigs, happy to be outside in the snow. The cows and pigs have extremely thick skin, which keep them comfortable even in unpleasant weather. Of course, the pigs also have a generous layer of lard. Being Tamworths, they have been bred for hardiness. Our cows (Herefords) are also a breed that does very well in the cold. 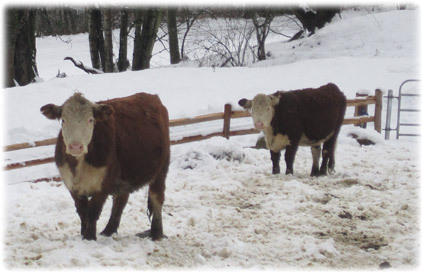 Our cows are Herefords, a breed which thrives even in the snow. Each season has its rewards. The snow is an excellent fertilizer for the pasture --- as it melts it releases nitrogen to the soil. And the freezing winter temperatures break up the cycles for any harmful microbes. Plus, the forage grasses get a rest in preparation for their burst of life in the spring. And the maple sap will soon be flowing... something we are definitely looking forward to.